This is a scalable context timeline. It contains events related to the event After December 29, 1998: Yemeni Authorities See Abu Hamza as Terror Leader. You can narrow or broaden the context of this timeline by adjusting the zoom level. The lower the scale, the more relevant the items on average will be, while the higher the scale, the less relevant the items, on average, will be. Police stop a car carrying supporters of Abu Hamza al-Masri on their way back from a paramilitary training camp in Wales. The supporters include Mohsin Ghalain, Abu Hamza’s stepson, and Mohammed Kamel Mostafa, his son. Abu Hamza, an informer for the British security services (see Early 1997), began setting up training camps and courses in Britain the previous year to prepare his supporters to fight for Muslim causes abroad (see (Mid-1997)). Authors Sean O’Neill and Daniel McGrory will point out that the police followed the men’s car for some time before it was stopped and, “The authorities clearly had this group on a watch-list.” The police search the car, making remarks indicating they expect to find firearms. However, none are found, as the weapons were given to the men’s trainers, ex-soldiers in the British army, after the end of the course. [O'Neill and McGrory, 2006, pp. 84] Ghalain and Mostafa will later attempt to carry out terrorist attacks in Yemen, but will be thwarted (see December 23, 1998). Abu Hamza al-Masri, a leading British imam and an informer for the British security services (see Early 1997), concludes an agreement with Zein al-Abidine Almihdhar, leader of the Yemen-based Islamic Army of Aden, who he had met in Afghanistan in the early 1990s. Abu Hamza sends followers for low-key militant training in Britain (see (Mid-1997) and (1998)), but this training consists of little more than survival courses and he needs a location where firearms can be used more freely. Therefore, Almihdhar agrees to provide training in Yemen, at a cost of £1,200 (about $1,800) per group of trainees. 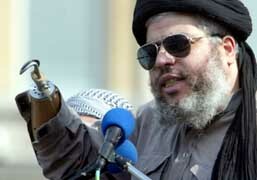 In return, Abu Hamza agrees to act as his press spokesman, and gives him a satellite phone costing £2,000 (about $3,200). Authors Sean O’Neill and Daniel McGrory will later describe the training: “The climate was brutal, the food inedible, and most of [the British recruits] complained that they missed their computer games and creature comforts. They got to ride horses, fire off several rounds of ammunition from an automatic rifle, and were instructed how to rig explosive devices by men who had fought in Afghanistan. They were also taught what else they would need to do to kill hundreds of innocents in an attack planned for Christmas day.” [O'Neill and McGrory, 2006, pp. 157-158, 162, 164-165] A group of Abu Hamza’s supporters who travel to Yemen for militant training with Almihdhar will later be arrested by police (see December 23, 1998) and Abu Hamza and Almihdhar will talk on the satellite phone during a kidnapping organized to engineer their release (see December 28-29, 1998). Attacking a hotel used by US troops. According to Ahmed Abdullah al-Hasani, who will later head the Yemeni navy and be Yemen’s ambassador to Syria, men from the Islamic Army of Aden (IAA) meet with Ali Mohsen al-Ahmar, half-brother of Yemen’s president Ali Abdallah Saleh. Al-Ahmar helped recruit Islamist radicals to fight in Afghanistan during the Soviet-Afghan War (see 1980-1990) and allegedly later received a payment from Osama bin Laden to help settle Afghan Arabs in Yemen (see May 21-July 7, 1994). The meeting follows the breaking up of an IAA plot to attack targets in Aden (see Before December 23, 1998 and December 23, 1998), and comes two days before the IAA takes Western hostages in an attempt to obtain the release of six recently arrested IAA operatives (see December 28-29, 1998). Al-Hasani will say, “Two days before the killings, members of the terrorist group were in al-Ahmar’s house in Sana’a,” the capital of Yemen. “They were also in telephone contact with Sana’a just before the shootings.” [Sunday Times (London), 5/8/2005] Authors Sean O’Neill and Daniel McGrory will write that during the kidnapping, IAA leader Zein al-Abidine Almihdhar “bark[s] out his demands for a prisoner swap over the telephone to a half-brother of Yemen’s President Saleh, among others.” Presumably, this half-brother is al-Ahmar. In addition, on the last day of the kidnapping Almihdhar tells a local dignitary, “We have contacts at the highest level and we are expecting a response from them at noon.” [O'Neill and McGrory, 2006, pp. 159-160] Exactly what al-Ahmar knows of the kidnapping in advance, if anything, is unclear. The trial of Zein al-Abidine Almihdhar, leader of the al-Qaeda-affiliated Islamic Army of Aden, begins. Almihdhar is on trial in connection with a bombing plot that some of his alleged operatives failed to carry off (see December 23, 1998) and a kidnapping he carried out in an attempt to get them freed (see December 28-29, 1998). The trial, which the authorities had predicted would last a mere 48 hours, drags on for months and Almihdhar turns it into a public relations exercise for himself. He is tried along with two other men; 11 more are tried in absentia. Confession - He gives his profession as “a mujaheddin warrior working in the cause of God,” and then immediately launches into what McGrory and O’Neill call a 45-minute “harangue,” during which he reveals details of how he planned and carried out the kidnapping.